p.s. would someone please send me a recap of the Biggest Loser Couples from last night, I unable to do the DVR and missed it due to our saints victory parade! Great Game! I was happy to see the Saints win. I watched the game and I never watch football. I rooted for the Saints and happily they won. Congrats on the win!! ;-) I watched half time show only! congrats for your team! Hi! Just read through your blog...you're doing so well! I saw you are struggling a bit with Mr. Scale...but remember...you will be victorious and he will be nothing more than scrap metal! 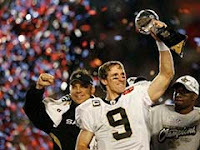 Was so glad to see the Saints win.. well deserved ..
Congrats! What a great game...and if ever a game was more about a city then just a game, this was it! Awesome!